This first post could be a glimpse of images from the mysterious/yet to be fully discovered – ancient past that motivates me to share my viewpoints through ‘glorioustamils’. Sitting in the city of Siem Reap, visiting ancient temples of Cambodia, one feels a strange connection between the Cambodian Ruins of yesteryear temples and the temples that are still in worship in Tamilnadu, India. And Cambodia is not the only country. Vietnam, Thailand and Indonesia are other countries I have visited that makes me feel the similar connection. The Temples and the Classic Temple Architecture of these countries have striking resemblances to those in South India, specifically Tamilnadu. Some of the Inscriptions on the walls of these temples mostly in ruins have also been identified to be Pallava Grantha – the script established by the Pallava Kings who successfully ruled most parts of then Thamizhagam/Tamilagam during the 4th to 9th Centuries ACE. The Shiva Lingams, the Lingams accompanied and sometimes not accompanied by Nandi (ruined by nature/man-made or stolen), the Eight Handed Vishnu in Angkor Wat and the Reclining Vishnu in Kulen Mountains are only a few to mention, which exhibit strong resemblance to the living/worshipped ancient temples of Tamilnadu and few other parts of Southern India. Ashtabhujakaram is a temple situated in Kanchipuram, Tamilnadu where, Eight Handed Vishnu armed with different weapons is the presiding deity. 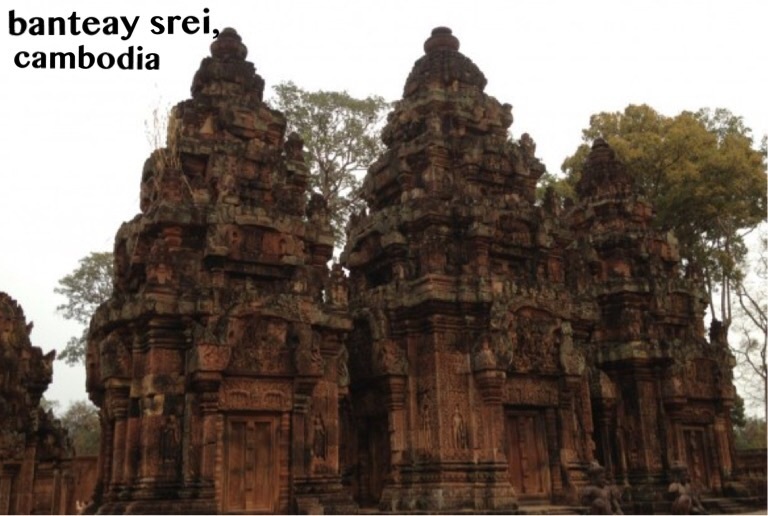 Similarly, Prasat Kravan is a 10th Century Temple in Cambodia, where Vishnu is sculpted as the Supreme God with Eight Arms. The Reclining Vishnu in Kulen Mountains sculpted under the flowing waters of Phnom Kulen, is sheltered by the Seven Headed Snake – Ananta. He is seen relaxing in reclining position, with his consort Lakshmi holding his feet; and Brahma is shown branching out of his navel. The sculpture under water is certainly a sight no camera can capture better than one’s eyes. The countless Lingams and Yonis alongside the reclining Vishnu and the thousand Lingams at Kbal Spean may also denote the co-existence of Saivism and Vaishnavism. Along with Brahma, the Trinity of Hindu Gods is seen represented at one place. 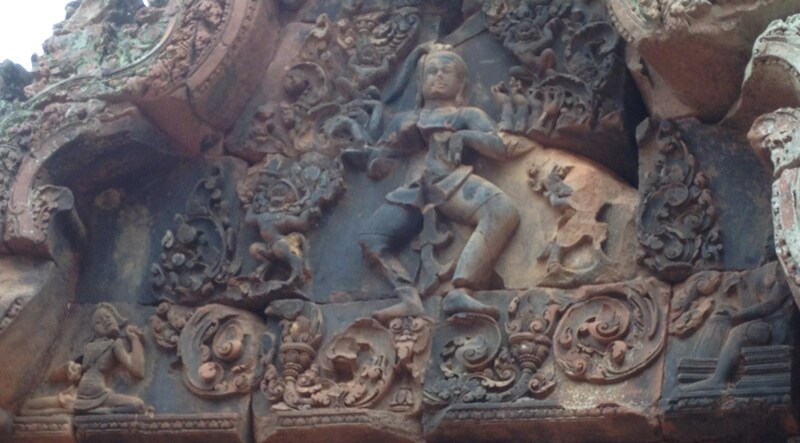 There are many other ancient sculptures of Reclining Vishnu throughout India. 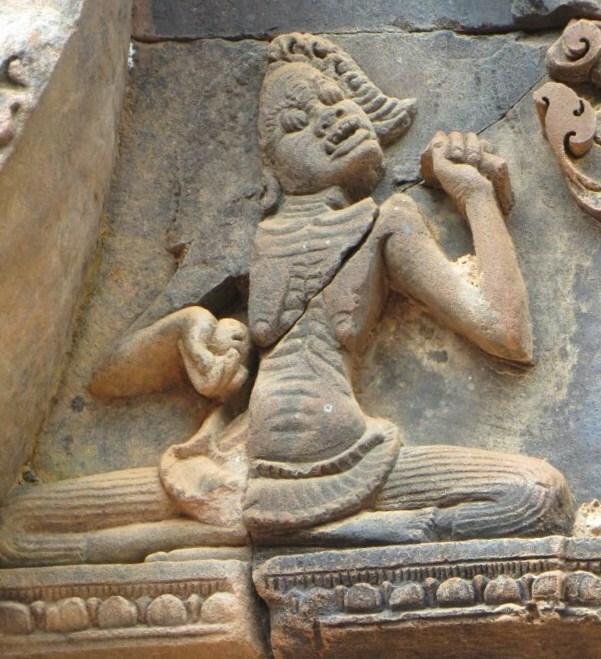 Which connection/influence does the Reclining Vishnu of Cambodia talk of? Any Connection which leads to Influence need not be one way, and could be reciprocal. What were the Reciprocal Influences churned out of specific Indian Connections? It is true that South East Asian Countries have plenty of Indian Influence, where Religion holds an enormous space. The efficient seafarers and merchants of coastal kingdoms couldn’t have transported and transferred their merchandises as a one-sided affair, but also must have brought back various known and unknown representations from the far off countries they visited. In this aspect, special emphasis on particular ancient kingdoms is needed for clarity in written history. One such historical fact, might be the travel of a Prince Pallavamalla from Kambhujadesa (present day Cambodia) to Kanchipuram, the capital city of the Pallava Empire in Tamilnadu. The history of south-east asian kingdoms would not be convincingly clear without adequate mention of influences of the Tamil Kingdoms. The same way, the history of the Tamil Kings and the Tamil People would certainly be incomplete without adequately exploring the Thailand-Laos-Vietnam-Cambodia and Indonesian connection. Much has been talked about the Indian connection in South East Asia, but here is a Cambodian connection in Tamilnadu. Pallavamalla, a Prince from the kingdom of Kambhujadesa travelled to Kanchipuram in Tamilnadu, to continue the legacy of the Pallavas. Following the death of Pallava King Parameswaravarman II (730 ACE) without a progeny, representatives from different arenas traveled to Kambhujadesa. Kambhujadesa was then ruled by King Kadavesa Harivarma, who rooted from Pallava lineage. He was the descendent of Bhimavarman, brother of Simhavishnu, the great king hailed to have brought back the Pallava stronghold in Thamizhagam – around 550 ACE. Pallavamalla, the fourth son of Harivarma agreed to go to Kanchipuram to become their new Ruler. From a Prince in Cambodia, he reached Tamizhagam, to be the King of the Tamils in the Pallava terrain as Nandivarman II. He excelled to be one of the greatest Pallava Kings, who not only took forward the skillful, aesthetic art of the extra ordinary ‘Pallava Style Temple Architecture,’ but also helped the Pallavas as rulers gain control of most parts of Tamizhagam and other parts of Southern India. Imbibed into the lineage of the architecturally inclined Pallavas, Nandivarman took to building beautiful temples as his predecessors, who were famous and revered for their fascinating temples. Among the other temples built by Nandivarman Pallavamallan, the beautiful ‘Thiru Parameshwara Vinnagaram’ or the Vaikunda Perumal Kovil in Kanchipuram, the Pallava Capital is important as the temple walls depict the story of his coronation and especially the Pallava Geneology. ‘Samudramanthan’ or churning of the eternal ocean, which is given primary importance in Cambodia and other parts of south-east asia is also sculpted on the walls of Vaikunda Perumal Temple. Karaikkal Ammaiyar holds a very special place in Tamil Bhakti Movement. She was the earliest of the 63 Nayanmars (Saivite Saints) and also one of the pioneer saints of the Indian Bhakti Movement – which was formed to curb the influences of Jainism and Buddhism. 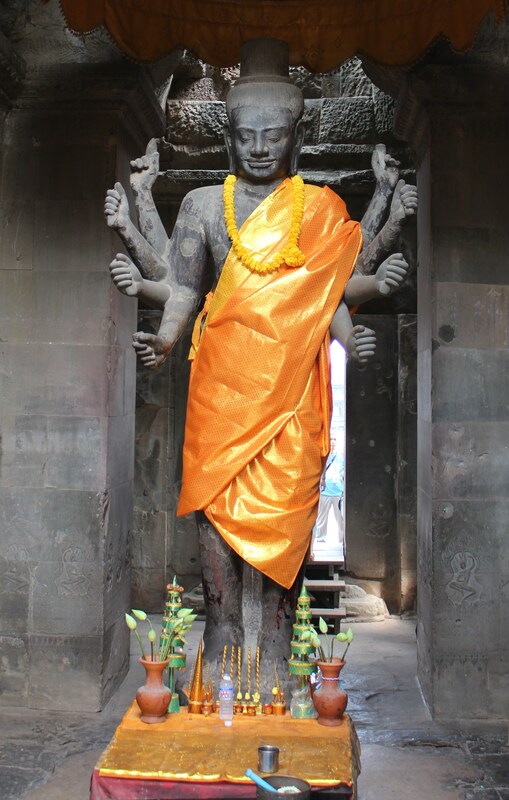 The sculpture of this Saint in Ghost/Demonic Form – ‘Peyuru’ in Tamil, can be found in a few temples in Cambodia. This certainly is one Glaring Evidence of the Tamil Connection. How did Ammaiyar from Karaikkal in present day Puducherry, under the then Pallava Empire visit Cambodia through her sculptures? Who transported her.. How could this be just a transport of temple architecture alone? Many Researchers indeed feel more than a simple transport, inclusive of cultural, linguistic and economic ties. Some of the Inscriptions on the walls of temples in Cambodia, which Archeologists and Linguistics claim to be Pallava Grantha, and mentioned sometimes by local guides as Ancient Khmer has not had much research. Pallava Grantha was a writing method introduced by the Pallavas of Tamilnadu. The language might be Tamil, Ancient Khmer or Sanskrit but the script would require an all-inclusive research on ‘SPECIFIC INDIAN CONNECTION’. The ornamental beauty of the Pallava Grantha, exclusively developed to write Sanskrit in the Tamil speaking areas, which is also found in Cambodia, Vietnam, Laos, Thailand and Indonesia, needs a deep analytical view. Why I call this ‘Specific Indian Connection’? As an Indian, any historical research to me would be incomplete if the word ‘India’ alone is mentioned. I want to know more… more precise facts – ‘which part of today’s India?’ – South, North, East, West or North East? Which state in today’s India? 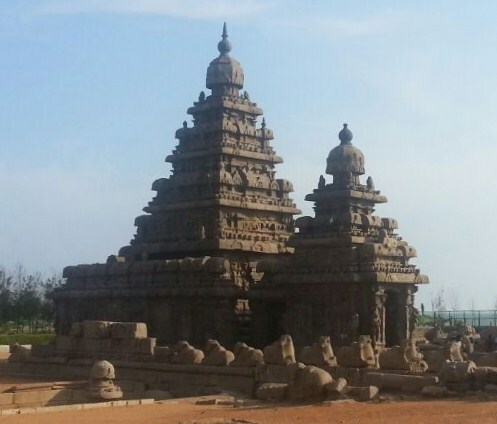 So, when I see the beautiful temples in Cambodia, Vietnam and Indonesia, (the ones that I have visited till date), I am awestruck by their similarities to the Indian temples… But to be more precise, South Indian Temples which belong to that particular part of Southern India – Tamilnadu! Well read Scholars and Researchers find different other connections with other parts of India too. In today’s world, Advanced Research Standards have been developed. Such Advanced Research Techniques with Technology, could aid in a ‘Microscopic View’ of the area of study – historically, geographically and scientifically! Hence, It is a humble feeling of a history enthusiast to emphasize the need for a comprehensive, all-inclusive study on the TRUE Indian Connection. These and many more thoughts and questions that arise along with the simple single word ‘CONNECTION’ is the lifeline of this Blog. The very few topics put forward in this preface itself is sufficient enough to explain the ‘need to connect’ this Jigsaw Puzzle called South East Asia and Tamilnadu. Of Course, there have been different influences which history and legends of concerned countries talk about the vast country called India. It is high time we give minute attention focusing on ‘Specific Connections and Influences’ from different parts of India. Here, in this blog, I have chosen to explore the Tamil Connection. I register my true Awe and Admiration towards all other Indian Kingdoms, Indian Merchants and Skillful Seafarers, who without any technologically advanced assistances of today, tried making this Vast Globe into a Small World of Connected Kingdoms. With due respect to all Researchers who have put in their knowledge, time, effort and life to the cause of true historic research, this blog is a layman’s approach to history and a commoner’s wish to portray research in its true form – one which could inspire the discovery of new things with a specific, scientific, systematic approach. This is a Genuine Wish for more ‘In-depth Researches’ which would help unearth Precious Information – many more New Commodities from Ancient-Old stock. It is also a hopeful desire to spread an inquisitive interest in many more energetic minds and scholastic brains beyond age and borders as much as possible in discovering new truths.